Idol Plasto PVT. LTD. at Kisan Exhibition- 16 to 20 December 2015. At Kisan exhibition, the company got a huge response from Agriculture market as well as the Farmers all over the Maharashtra. 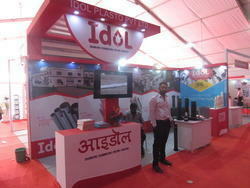 At Kisan exhibition, Idol products got a market to new heights. 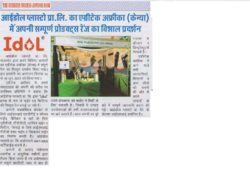 Idol has a presence at Hisar, Krishi Darshan Expo held on 15-17 October, 2016. 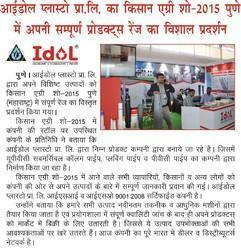 Idol has achieved a great response from existing customers and consumer market. Idol Plasto Pvt. Ltd. has Participated at AgriTech Africa (Kenya) from 14th June 2017 to 16th June 2017 to cover up International market And Displayed whole product range of Idol Plasto Pvt. Ltd ,i.e. IDOL UPVC and CPVC Pipes & Fittings.